Red Bull's appeal against Daniel Ricciardo's Australian Grand Prix disqualification has been rejected. Australian Ricciardo, 24, lost second place because his car used more fuel than was allowed and his team refused to reduce the flow when informed. 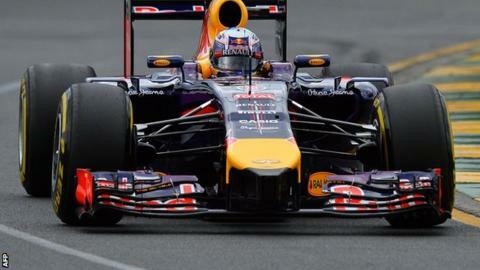 Red Bull were "disappointed" but accepted the decision, confirmed by the International Automobile Federation. It means Ricciardo will not recover the 18 points lost in Melbourne, leaving him 10th in the standings. In a statement, the team said: "We are of course disappointed by the outcome and would not have appealed if we didn't think we had a very strong case. "We always believed we adhered to the technical regulations throughout the 2014 Australian Grand Prix. "We are sorry for Daniel that he will not be awarded the 18 points from the event, which we think he deserved. We will continue to work very hard to amass as many points as possible for the team, Daniel and Sebastian Vettel throughout the season." Following the introduction of new regulations, engines must have a fuel-flow rate of no more than 100kg/h at full throttle. Teams are obliged to follow these guidelines and to use data from an official sensor to interpret fuel flow. Stewards said Red Bull were given the opportunity to comply during qualification and five laps into the Melbourne race, but chose not to. However, the team claimed inconsistencies with the fuel-flow meter had been prevalent all weekend "up and down the pit lane". Five hours after finishing second behind the Mercedes of Nico Rosberg, Ricciardo was stripped of his runners-up spot. McLaren's Kevin Magnussen was promoted to second, with his team-mate Jenson Button moving up to third.